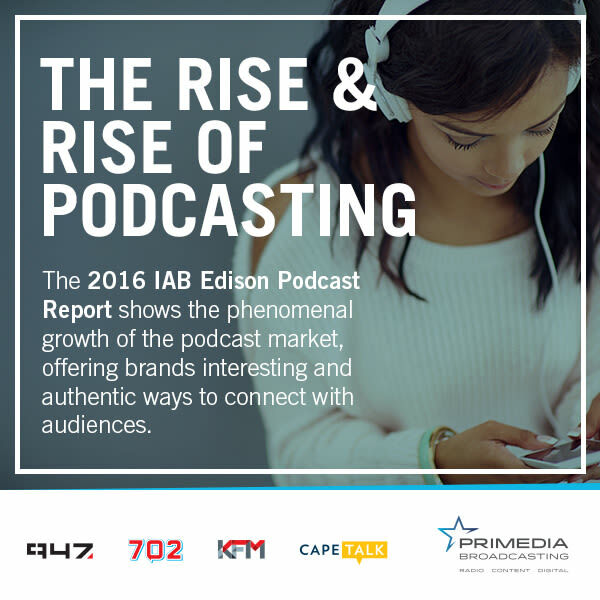 At Primedia Broadcasting, we were excited to read the findings of the 2016 IAB Edison Podcast Report which reinforces the great stats we have on our own audio on demand offerings, and shows that this is a hugely appealing and growing market segment. Last year, Primedia Broadcasting launched our dedicated podcast portal, Life (lifenow.primedia.co.za) in April and by the end of December, we had recorded 1.6 million podcast downloads. We also launched our digital audio adverting on our streams, which recorded over 400 000 unique users monthly. The key outtakes from this report from IAB Edison, which is based on US and global trends affirm that while still new, podcast downloads are growing rapidly. A lot of this growth is associated with Smartphone penetration and user maturity, and reflects the turn towards audio on demand. Listeners want focused content and to be able to listen at their own time and pace. In addition to the growth in audiences, the study also revealed consumers’ sentiment to respond to brand advertising on the channel. For instance, 65% of podcast listeners said that they were more willing to consider products and services after hearing about them in a podcast. In addition to this positive sentiment, there was also evidence of action – 45% of listeners had visited a sponsor’s website; 37% had gathered more information; 28% had used a promotional code and 26% had watched a movie as a result of hearing about it in a podcast. There’s more detail in the full presentation DOWNLOAD HERE. Primedia Broadcasting offers a number of commercial opportunities for digital audio, from programmatic digital audio stream advertising, to sponsored or custom created podcasts and can tailormake solutions to deliver results to client’s specific needs.